Chennai, March 28. A belligerent Virender Sehwag presided over a bowlers' bloodbath and blasted an unbeatean 309 as India responded emphatically to South Africa's massive first innings total in the first Test here today. Sehwag's savage innings, the fastest triple century in the history of Test cricket, was studded with a staggering 41 fours and five sixes. He bettered Matthew Hayden's 300 off 362 balls against Zimbabwe in Perth in 2003-04. Even after Sehwag reached 200, there was no let up in South Africa's misery and the batsman took just 31 balls to complete his 250. There was no signs of nerves even when he was nearing his 300. 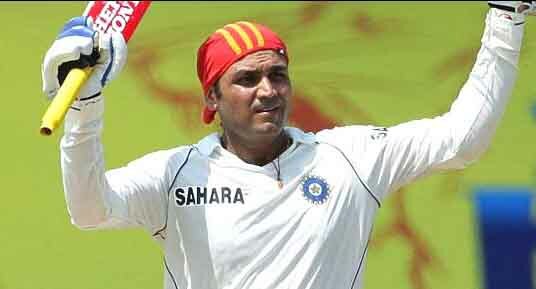 Then at 291, Sehwag stepped out to send a Harris delivery soaring over the sightscreen. Bowling: Steyn 19-1-79-0, Ntini 18-2-99-0, Morkel 18-3-56-0, Harris 36-3-141-1, Kallis 12-0-61-0, Prince 3-0-16-0.